Together, they greatly increase access and response time for orthopaedic care within Berkshire Health Systems– a major benefit for the growing number of area residents needing orthopaedic consultation and treatment. Whether it’s an accident or sports-related injury, a recurring hip, knee or shoulder ailment or any other type of bone and joint issue, patients can expect same-or-next-day service for emergent cases and prompt appointments for other referrals and direct calls. 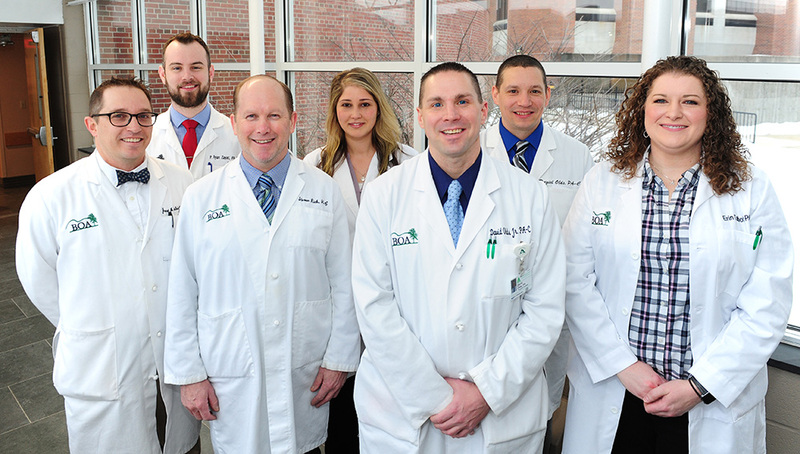 Five Orthopaedic Physician Assistants, together with seven Orthopaedic Surgeons, lead the team of professionals providing orthopaedic surgical and treatment services to patients at BMC and Fairview Hospital. One of those Physician Assistants, Joseph Kotelnicki, says he and his colleagues are proud to be able to bring not only a higher level of medical care, but a close, one-to-one connection with every patient that comes through the system. The addition of the PA group at Berkshire Orthopaedic has proven so successful that patients routinely schedule appointments directly with a PA, knowing they will be seen sooner and have a consultation and examination with a highly qualified orthopaedic professional. If joint replacement or another type of surgery is needed, the patient’s case moves directly to the surgeon, of course, while the PA continues to provide pre- and post-surgical treatment. What is an Orthopaedic PA? Physician Assistant – or PA – is a full-fledged medical professional who works as part of a team with a doctor. A PA is a graduate of an accredited PA educational program who is nationally certified and state-licensed to practice medicine with the supervision of a physician. These highly trained professionals perform physical examinations, diagnose and treat illnesses, order and interpret lab tests, prescribe medications, perform procedures, assist in surgery, provide patient education and counseling and make rounds in hospitals and nursing homes. For orthopaedics and all specialties, PA educational programs are modeled on the medical school curriculum, with a combination of classroom and clinical instruction. The PA course of study is rigorous and intense. The average length of a PA education program is 27 months beyond a bachelor’s level education. In addition, PAs also complete more than 2,000 hours of clinical rotations, with an emphasis on primary care in ambulatory clinics, physician offices and acute or long-term care facilities. Rotations include family medicine, internal medicine, obstetrics and gynecology, pediatrics, general surgery, emergency medicine and psychiatry. Practicing PAs participate in lifelong learning. In order to maintain national certification, a PA must complete 100 hours of continuing medical education every two years.